Really, They Should Call Them Kid Peeves and Not Pet Peeves. Overall, I consider myself pretty anti-sticky. Sticky and I do not mix. Lollipops. Maple syrup. Ice cream. Glue sticks. Cotton candy. Caramel. Timbits. Honey. Laffy Taffys. Gum. Juice. The problem with this, of course, is that I am the mother of three young children, two of which tend to be on the sticky side more often than not. It’s really repulsive, actually. This weekend, on sort of a semi-whim, we grabbed the kids and took them downtown for brunch and to visit Kensington Market and Chinatown for the first time. We often forget that Toronto is such a wonderful city with all of these great nooks and crannies filled with loveliness. We live in the nosebleeds, which means, essentially, that we dont really live anywhere near downtown andÂ requireÂ both a car and a subway ride to get there. After spending the last few months working downtown and exploring some of the neighborhoods, I realized that we never take advantage of what this city has to offer. And so, brunch at The Drake Hotel. It was lovely, really, and something different for the kids. They didn’t really notice, as they were elbow deep in their buttermilk pancakes with ice cream and maple sugar berries. Pancakes. Ice cream. Maple Sugar berries. Of course, the beauty of having kids old enough to take semi-whim-like trips downtown is that we no longer need strollers or diapers or baby food or bottles or wipes or diaper bags. But, you know, NO WIPES. This meal was an anti-sticky girl’s nightmare. So, after hosing the children down as best as we could, giving them a fresh newÂ paletteÂ to decorate with further stickiness, we set out for the day. We visited Kensington market and explored the produce and the vintage clothing shops and the bakeries and the cheese shops. We tried on 800 pairs of sunglasses and looked at vintage cowboy boots. We went to Chinatown and bought a new wok and some chopsticks andÂ marveledÂ at all the new fruits and vegetables that we had never seen. And then. Oh my god. THEN. Someone who was not me bought these for the kids. 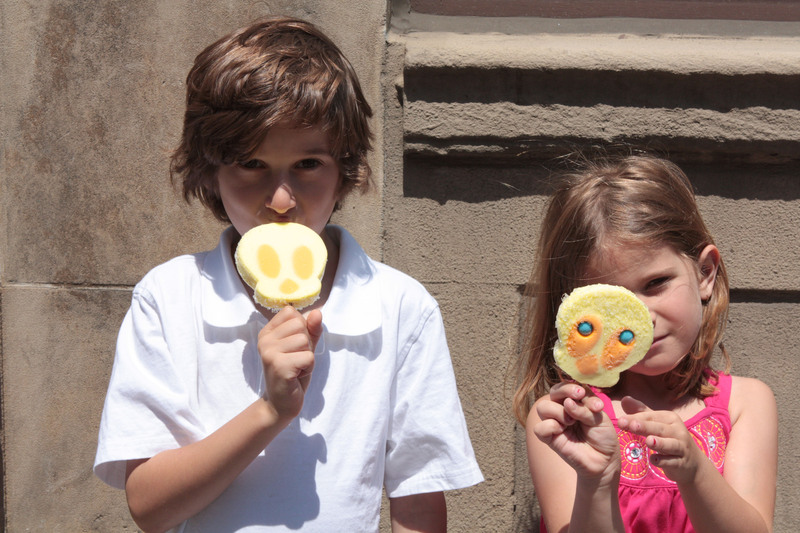 Do you know what happens to giant ice creams that are shaped like cartoon characters when they are out for more then 8.6 seconds in 90-degree weather? They were covered, head to toe, in sticky, goopy goodness. This is the stuff of nightmares, I tell you. The only thing that could possibly be worse would be if they wereÂ SIMULTANEOUSLYÂ CHEWING CEREAL IN MY EARS. If is largely accepted that you will be considered odd by carrying wipes if you have no children (as is my status), but I think people shoudl really carry both baby wipe like wipes and some antibacterial wipes at all times. And a small first aid kit. yes. I have LOADS of anti-bacterial hand gel…only it doesn’t really help when your child is covered head-to-toe in ice cream. Heh. Now I have to go to Bath & Body Works online and buy oodles – and hope they have wipes too. I’m adverse to sticky. And mess. And repetitive noise. I really should’ve thought this kid thing through more carefully. I will be carrying a baggie of baby wipes until the last child is dropped off at his respective university. Sometimes I think about carrying wipes for my person and I’m just a 33-year old woman! I keep them in my car…because, really, they are AMAZING. I totally thought of you yesterday when Katelyn was eating diced fruit with her hands and getting the juice everywhere. Why, oh why, can’t kids be born with the ability to eat with silverware? oh…don’t even get me started on babies and fruit. I spent most of the time gagging…or forcing someone else to feed them the fruit because OMG. Wipes are the greatest invention in the history of ever. Better than fire. Better than electricity. The only thing better is the anti-bacterial wipe. I’m now having popsicle nostalgia. And remembering I too hate to be sticky. But mmm, popsicles. I took my kids to Chinatown once. No one bought them icecream but the did embarass me by loudly announcing in any shop we went in that it “smelled funny”. As if my five foot eleven self didn’t stick out enough down there.